Just one local by-election this week. 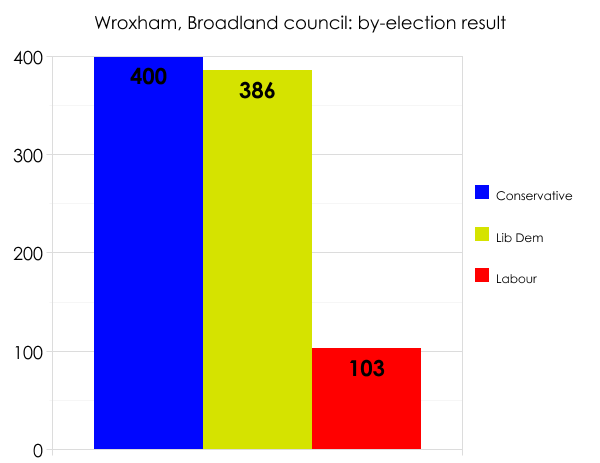 The Tories took a seat from the Liberal Democrats on Broadland council in Norfolk. Note that Ukip didn’t field a candidate. East Anglia is ostensibly one of its heartlands, but for whatever reason the party didn’t decide to fight this particular contest. There was a by-election in this ward earlier in the year, and on that occasion the Lib Dems won comfortably. Perhaps the timing of this week’s poll had a part to play in the outcome; the number of votes cast across the board was down by about a half. Broadland is a safe Tory council. The party now holds 32 of its 47 seats. Next Thursday there’s at least one by-election that I know of: a seat on Newcastle city council. The contest was triggered by the resignation of a sitting Liberal Democrat councillor. The Lib Dems still have a fair presence in Newcastle, holding 24 of the 78 seats. Watch to see whether the “summer holiday” factor has any influence on this contest, to the detriment of the Liberals and to the favour – I would guess – of Labour. The Lib Dem vote actually held up pretty well, even though they lost the seat. An intervention by UKIP might just have allowed them to keep it.